KEF R100 review | What Hi-Fi? 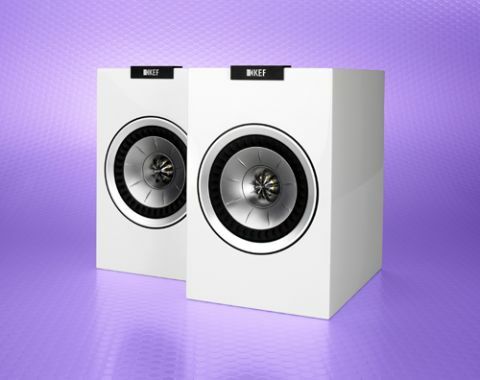 It was in the summer of 2012 that we first tested the KEF R100s. They impressed us enough to earn five stars, and we noted in particular that many rivals would struggle to match their show-stopping scale and soundstage. But it’s been a while, and the midrange standmounter market is packed with newer alternatives. So how do the R100s fare? Pretty well, as it turns out – these KEFs remain some of the most tempting speakers at this price, even if they’re no longer in the top rank. Despite being a little older, the R100s are just as shiny and attractive as any of the newcomers. Build quality is befitting that of £600 speakers. The cabinet is solidly built and nicely finished in high-gloss black or white, or wood veneer in walnut or rosewood. It’s a timeless design, made all the more striking by the distinctive driver arrangement: a 25mm aluminium-dome tweeter sitting in the middle of a 13cm magnesium-aluminium alloy mid/bass driver. This is KEF’s distinctive Uni-Q arrangement, designed to encourage more consistent dispersion than traditional, separated drivers. The tweeter itself has a few tricks for improving dispersion: ‘tangerine’ wave guides and a vented design that takes inspiration from KEF’s high-end Blade speakers. The mid/bass cone, meanwhile, is reinforced with equidistant creases for improved rigidity. Quite a few tricks, then, and when the music starts to play it’s immediately apparent how effective they are. Sound is dispersed high and wide on a full, expansive soundstage. The sense of scale is broad enough to raise suspicion about extra speakers hidden away. Stereo imaging is very precise, with voices and instruments placed very deliberately in the room. Each element is clearly defined and given plenty of space. Integration between treble and midrange is seamless, and listeners will struggle, aurally, to separate the two drivers on each speaker. Tonally, the R100s are nicely balanced, with no part of the frequency range feeling exaggerated. The authoritative bass occasionally feels a touch unwieldy, and we’d like a little more refinement in the treble, but otherwise it’s a rounded, likeable sound that’s easy to live with. Elsewhere you get ample detail, strong dynamics and a decent sense of timing. On their own, these KEFs present a good, well-proportioned set of skills. But that’s where the newer rivals come in, and a few flaws become apparent. The Monitor Audio Silver 1s have stronger dynamics; the Bowers & Wilkins 685 S2s have snappier timing and greater energy. Put these together and these competitors succeed in making the KEFs seem a little safe. We stand by our original remark, however, that many rivals would struggle to match the KEFs’ scale and soundstage. And let’s not forget about that seamless integration. And so the R100s finally lose their fifth star. But there’s no shame in being overtaken by newer rivals. We still think these are highly commendable speakers for the money. If you’re after a good-looking set of standmounters and a spacious sound, these KEFs amount to a good all-round proposition and are well worth a listen.